Willie Morris led Wilmington with 21 points Tuesday night in a 61-41 win over Miami Trace. WILMINGTON – In the midst of a four-game losing streak, Wilmington High School boys basketball coach Mike Noszka felt it was time to reassess team goals. Miami Trace will be going to Jackson in Frontier Athletic Conference play Friday. Wilmington returns to SBAAC American Division play Friday when Western Brown visits FSC. The Broncos defeated Wilmington in the first matchup at Mt. Orab, 52-31, on Dec. 14. In the early minutes of the game, things did not go well for the Hurricane, as the Panthers jumped out to a 17-9 first quarter lead. 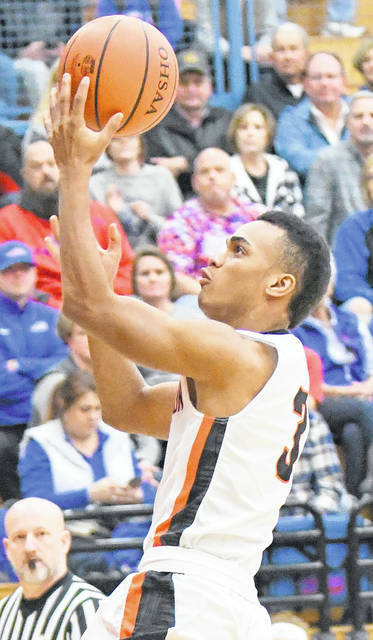 Steadily, Wilmington chipped away at the Panther’s lead, and after three consecutive three-pointers by Morris, Jacobyansky and Coomer, the Hurricane took a 26-21 lead and never looked back. (41) MIAMI TRACE (2fg-3fg-ft-tp) Moore 0-0-3-3, Barker 1-3-0-11, Bernard 0-1-0-3, Mathews 4-2-0-14, Conn 0-1-0-3, Steele 0-1-0-3, Brown 2-0-0-4, Rodgers 0-0-0-0. (61) WILMINGTON (2fg-3fg-ft-tp) Morris 6-3-0-21, Coomer 3-2-1-13,Sweeney 0-0-2-2, Custis 1-0-1-3, Anicic 0-0-0-0, Spears 0-0-0-0, Jacobyansky 1-3-3-14, Butcher 3-0-2-8, Stewart 0-0-0-0.